The Writer's Book of Doubt contains essays and illustrations providing hope, encouragement, and inspiration for writers. 215 backers pledged AU$ 8,306 to help bring this project to life. Update: We funded in under 5 hours! Thank you! Why don't I have any ideas? Why haven't I written anything?Why haven't I written anything good?Why won't anyone publish my stories?Why won't anyone pay me for my stories? The Writer's Book of Doubt by Aidan Doyle is a book of comfort for writers. An acknowledgement that writing can be a difficult and lonely process. It includes essays and advice from a number of writers and will be illustrated by Hugo and World Fantasy nominated artist, Kathleen Jennings. It will an include a revised version of the Science Fiction Writer's Hierarchy of Doubt accompanied by Kathleen's illustrations. (These are preliminary sketches, not the final artwork). The book includes guest essays from a range of writers giving advice on how to deal with doubt and providing examples of encouragement and hope. The essays are reprints, but many of them are revised and expanded. Why Doesn't My Doppelganger Have Imposter Syndrome? The Writer's Book of Doubt will be available as an ebook (mobi/epub) and paperback. $6000 AUD ($4400 USD) - An original Martha Wells (Murderbot author) essay on The Ups and Downs of a Long Career will be included in the book. $7500 AUD ($5530 USD) - Larger art print. Backers at the art print level will have the option of choosing from a 20x16 or a 16x12 print. $10000 AUD ($7400 USD) - Color map of Submissionland. Kathleen will do a color version of Map of Submissionland. Backers at ebook level or higher will get an electronic version. Art print backers will have the choice between color or black and white print. $14000 AUD ($10300 USD) - Audio book version narrated by Tina Connolly (available for anyone who backs at the ebook level or higher). N.B The audio version might not contain all of the articles since it will involve purchasing audio rights from the contributors. Writers who struggle with doubt. Writers who have conquered all of their doubts should buy copies for their friends. Kathleen Jennings is an illustrator (and writer) based in Brisbane, Australia. 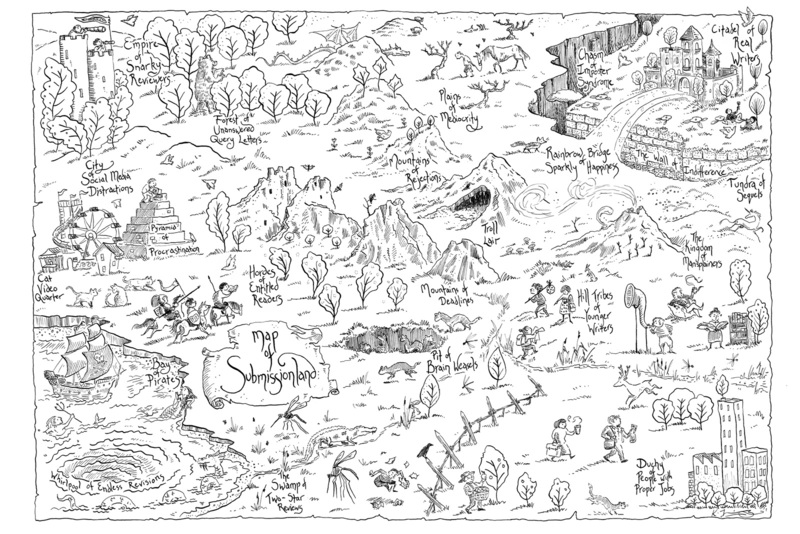 She has created illustrations and cover art for many international authors and publishers, and her maps appear on the cover of Christopher Rowe's Telling the Map (Small Beer Press) and in Holly Black's The Cruel Prince and The Wicked King (Little, Brown; forthcoming). She is a Hugo finalist, has three World Fantasy Award nominations, and several Ditmar Awards to her name, and can be found online at kathleenjennings.com and tanaudel.wordpress.com. I ran a successful Kickstarter last year and delivered the anthology a month early this year. The project will be dependent upon Kathleen for the remaining illustrations. She has a track record of successfully delivering artwork for publishers. If you just want to support the project. If you like, you'll be listed in the book's acknowledgements. The eBook in epub and mobi formats and a listing in the book's acknowledgements. The paperback and eBook and a listing in the book's acknowledgements. A 16x12 inch print of Kathleen Jennings' Map of Submissionland on archival matte paper. The paperback and ebook and a listing in the book's acknowledgements. Choose this version for cheaper postage to non-US destinations.